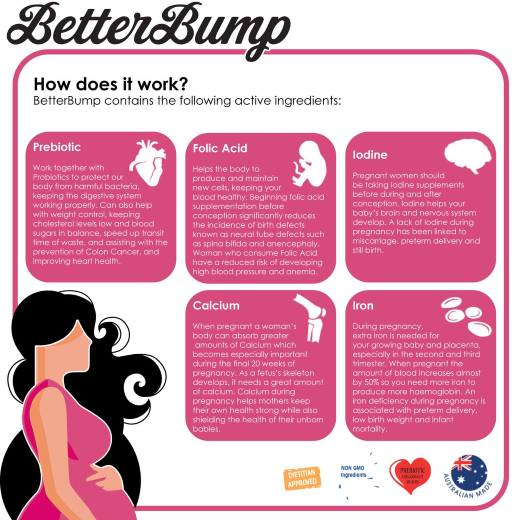 BetterBump, your maternal health and lactation bar, has been carefully developed by a prominent dietitian specializing in good maternal health before, during and after pregnancy, in conjunction with a leading food scientist. A prebiotic has been included because before and during pregnancy as well as whilst feeding good gut health is important for both mother and baby. This bar contains ingredients that may help support normal milk production (lactation) during feeding. This unique and innovative product has been designed specifically with maternal mothers in mind. 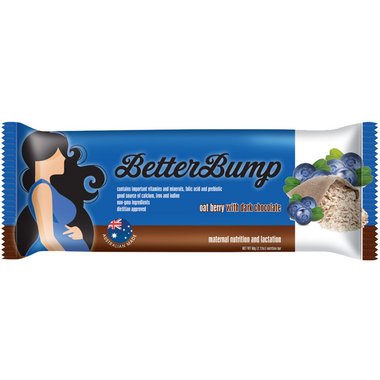 The bar can be consumed by anyone looking for a delicious and healthy snack but is scientifically designed to enhance your pregnancy before, during and after child birth. 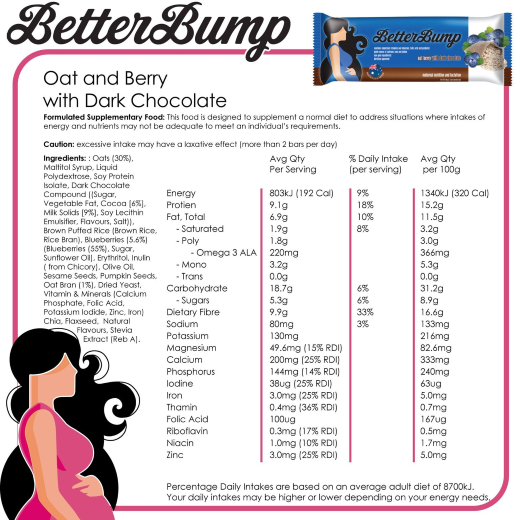 Ingredients: Oats (30%), Maltitol Syrup, Liquid Polydextrose, Soy Protein Isolate, Dark Chocolate Compound ((Sugar, Vegetable Fat, Cocoa [6%], Milk Solids [9%], Soy Lecithin Emulsifier, Flavours, Salt)), Brown Puffed Rice (Brown Rice, Rice Bran), Blueberries (5.6%) (Blueberries (55%), Sugar, Sunflower Oil), Erythritol, Inulin ( from Chicory), Olive Oil, Sesame Seeds, Pumpkin Seeds, Oat Bran (1%), Dried Yeast, Vitamin & Minerals (Calcium Phosphate, Folic Acid, Potassium Iodide, Zinc, Iron) Chia, Flaxseed, Natural Flavours, Stevia Extract (Reb A). These are Delish!! I've tried all the flavours and it's tough to pick a favourite. They seem to have helped with my supply too.